Mark Andy, Inc., Chesterfield, MO, a manufacturer of rotary printing and die cutting machines, recently made improvements to its part finishing processes that have dramatically improved turnaround time and eliminated troublesome glitches in its just-in-time inventory system. Mark Andy's rotary printing and die cutting machines are leading-edge systems incorporating features like the recently introduced Advanced Control Convertible Platform design. This feature allows customizing the press with flexo, UV flexo rotary screen, foil stamping, waterless offset, and rotary die cutting in any sequence to best obtain the graphic and converting requirements to do the job. Mark Andy's Model 2200 narrow web printing press is designed on a building block concept to be assembled according to a customer's needs. Building and assembling these complex systems to meet customer requirements and delivery schedules requires careful just-in-time planning and part management. To satisfy established finish requirements, exterior and housing components are electrostatic polyester resin-painted while dimensionally critical internal components are electroplated or black oxide-coated. Parts with high wear surfaces are hard chrome-plated and ground to precise final dimensions. Many other parts do not have the high wear requirement but are part of the drive mechanisms and require non-dimensional finishing for corrosion protection. Coordinating the supply of components in the correct sequence and quantities for final assembly is a demanding process. A problem with any one of the final finishing stages can delay the overall assembly. And, that is what began happening with Mark Andy's outsourced hot oxide finished parts. In the past, these parts (drive shafts and other functional components) were sent outside for hot oxide finishing, a process which provided good corrosion protection without altering the dimensions of the parts. When complete, the parts would be shipped back to Mark Andy for inspection and assembly. But as Mark Andy's volume requirements grew and the hot oxide process became more heavily regulated and costly, problems increased with the finish quality, turnaround time and cost. Fewer sources in Mark Andy's area offered the process. Those that did ran the process on an intermittent basis to accumulate part quantities for an adequate part run. Timely deliveries of black oxided parts became a growing problem, forcing Mark Andy to carry larger inventories of certain components to ensure minimum stocking levels while they waited for deliveries from the outside platers. Couple this with growing demand for its new machines and the fact that today's customers require shorter lead and delivery times. Mark Andy's production engineers had to find a better way. Gears and other functional components of Mark Andy's Model 2200 are blackened for corrosion protection and appearance enhancement with the new Color Safe system from Birchwood Casey. Mark Andy is actively implementing the Kaizen Program, which systematically studies the operation of each department within the company to determine better ways to work efficiently. Byron Bievenue and Thomas Cecil, manufacturing engineers for Mark Andy, had responsibility for evaluating finishing options. In looking for alternatives, the two decided to test the in-house blackening concept using traditional cold blackening processes, at first, on a small scale. They continued to use outside hot oxide sources while they examined in-house alternatives, costs and scheduling requirements. Testing the process on a small scale allowed for evaluation of different processing parameters such as immersion times, racking techniques, sealant options, etc. By coordinating with the quality department, it was easy to narrow the field and optimize the process conditions. The critical factors to evaluate included appearance, corrosion resistance, thickness, and scratch resistance. Tom Cecil of Mark Andy inspects Color Safe finished part which provides an attractive and protective black finish of 0.000050 inch thickness taking just 15 to 20 minutes from start to completed part. A conventional cold blackening process using copper and selenium based chemistry was tried first. The finish passed all the pertinent tests, but the chemicals were EPA regulated and monitored by the local sewer district. However, this is not a problem because the process can be installed with an Ion Exchange system which keeps all rinse waters out of the drain entirely. But after further review, they decided the ideal option would be one which did not contain EPA regulated chemicals at all and was safe to use in the general plant area. Bievenue and Cecil eventually selected Birchwood Casey, a metal finishing system supplier to help them solve their problem. Birchwood Casey recommended their new blackening concept called the Color Safe® process. The Color Safe process is a cold blackening system that does not utilize boiling caustic soda like the conventional hot oxide, or copper and selenium salts, like other room temperature blackening methods. Developed and patented by Birchwood Casey, Color Safe starts with an iron oxalate crystalline deposit, then permanently blackens it with a special non-toxic, reactive dye. According to Birchwood Casey engineers, the process is somewhat analogous to black anodizing on aluminum, where a clear oxide type coating is first applied, then dyed to produce a permanently black surface. The end result of the Color Safe process is an attractive and protective black finish of 0.000050 inch thickness that uses none of the toxic or regulated ingredients found in other hot or cold blackening processes. Requiring just 15 to 20 minutes from start to completed part, the process operates at room temperature and uses mild solutions with no hazardous fumes. Another attractive feature is that the finish is ideal for all non-stainless steels, cast iron and powdered metal parts, covering the full range of materials that are used in the company's machine designs. "By starting small," reported Bievenue, "with a prototype scale line, we could control and observe every aspect of the process. We wanted to be able to study any problems that developed and deal with them on a manageable scale. We worked the test line into our daily production system so that a steady stream of Color Safe finished parts were completed along with conventionally finished, hot oxide parts. We did this so we could compare finishes. Keeping the test small had other benefits. "The investment in the test line was only about $500," said Bievenue. "We could back out at any time without much loss other than our time. Once proven successful, the prototype line allowed us to calculate investment requirements for a large scale line with credible cost-payback figures that we could submit to Mark Andy management to justify purchasing the system." 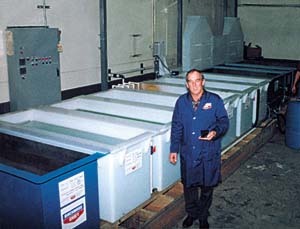 Mark Andy compared standard 100-gallon tank finishing systems with a custom 180-gallon tank system configuration with nearly twice the capacity. They wanted a system that would handle all of their various size parts, including long machine shafts. They also wanted a large enough system they could grow with so they wouldn't have to replace it in a few years with a larger one. Choosing the larger system ended up as an easy choice because not only did it provide almost twice the capacity, it cost only about a third more than the standard size system, both of which included part dryers. 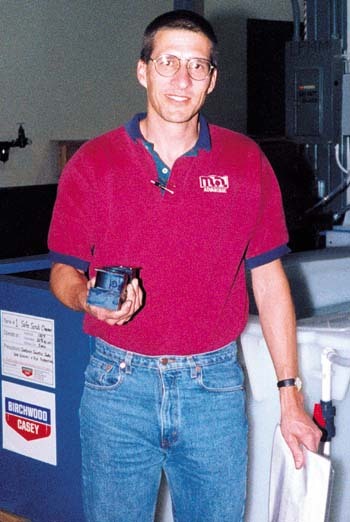 The larger system also allowed Mark Andy to finish larger batches of parts daily as needed. Terry Fields, Birchwood Casey area manager, provides on-site fine tuning of the 180 gallon Color Safe system from Birchwood Casey. The system eliminated delays of sending parts outside for finishing. Mark Andy's finishing system fit conveniently in an area adjacent to the stock room, where parts are delivered by forklift for finishing. An overhead monorail hoist is in place to move heavy parts through the process line. Each tank (24 x 72 x 30" holding 180 gallons of operating solution) utilizes simple, on-site operator testing with a kit provided by Birchwood Casey. This monitoring is backed up with regular no-charge analysis at the Birchwood Casey laboratories to ensure correct chemical balance and consistent quality. "Making the move to the finishing system was similar to adding any new piece of capital equipment," says Bievenue, "and by doing the prototype test for five months we were certain of the results before committing to the larger, permanent system. Looking back on the increased benefits, we just should have done it a little sooner." Birchwood-Casey, 7900 Fuller Road, Eden Prairie, MN 55344 Phone: (800) 328-6156 Fax: (612) 937-7979 Web: www.birchwoodcasey.com.